Since March 2001 we have been using this novel spray substance (SprayGel™ / SprayShield™) to prevent adhesions following gynaecological surgical procedures. Adhesiolysis surgery on a Frozen Abdomen results in a huge wounded areae. To cover such an extensive area with SprayShield is nearly impossible and would take 5-8 kits of SprayShield, this 3500$-5000$! To avoid such extreme expenses we have developed new techniques and new procedures to reduce SprayShield and have now a modified procedure, that allows to reduce or even exclude SprayShield completely. We have now finished 10 patients with only gasless Lift-Laparosccopy, Adept adhesion Barrier, special additives and a unique special peri-operative procedure. We can compare those out come to more than 1000 adhesiolysis cases utilizing gas less Lift-Laparoscopy, SprayShield adhesion barrier and a 2nd look laparoscopy and I want to say: the initial results are excellent! 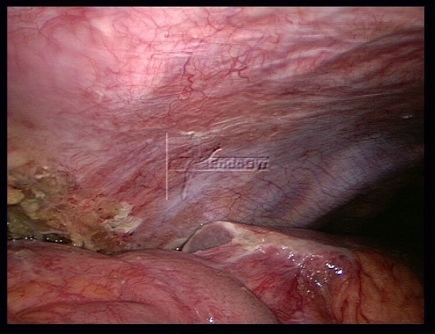 In general, adhesions are formed after all surgical measures involving laparotomy. But even during laparoscopy, which is a minimally invasive procedure, wound surfaces form during certain procedures, such as for example endometriosis or myoma operations. 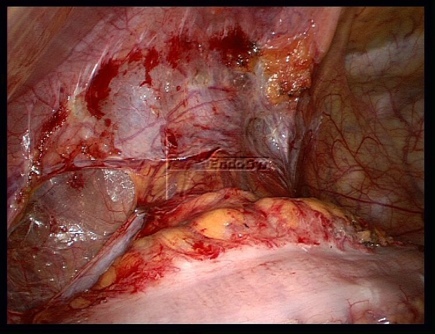 The SCAR studies show that laparoscopy has the same adhesions formation potential as laparotomy and high-risk-laparoscopy like extensive endometriosis surgery cause even more adhesions than a laparotomy. Wound surfaces adhere to each other and form adhesions. Abdominal and pelvic adhesions can cause problems such as pain, adhesions of uterine tubes (infertility) or of other organs (intestines / ovaries / uterus). Adhesions have the potential to cause chronic problems and pain requiring treatment procedures and possibly even adhesiolysis, as a surgical procedure to remove adhesions. After adhesiolysis the gel substance (SprayShield™) is sprayed on the wound surfaces, where it remains in place for some days after surgery. Since adhesions are formed within 7 days of surgery, the barrier shield prevents formation of adhesions. After this period, SprayShield™ is broken down and absorbed by the peritoneum to be cleared from the body via the kidneys. Carbon dioxide customarily used to insufflate the abdomen during laparoscopy converts the entire peritoneum into an acidotic environment. This results in oxygen being withdrawn from the tissue. Lack of oxygen cause cell-death with formation of global wound surfaces in the peritoneum and abdominal organs. The potential of forming adhesions after a carbon dioxide laparoscopy was studied in the experimental work of Koninckx et al. to show that carbon dioxide is a co-factor in adhesion formation. By using gasless lift- laparoscopy, we avoid insufflation of carbon dioxide, which has been shown by the aforementioned studies to be a co-factor in adhesion formation. Since wound surfaces are always formed during any surgery because tissue layers are being separated, the formation of adhesions can additionally be prevented by covering wounded surfaces with SprayShield™. Gasless lift-laparoscopy and SprayShield™ is an ideal combination that prevents adhesions formation. Adhesions are known to form as soon as three hours after the completion of a surgical procedure – and will continue to form for up to about four days. Please see what happens, if surgeons are not using any adhesions barrier. If adhesions still have formed during this critical time period, they can easily be “swept down” by the surgeon by aqua dissection without bleeding during the second look laparoscopy – and more SprayShield™ can be applied, if needed. In those patients who have small adhesion attachments to the surgery sites at the second look laparoscopy 7 days post-operatively, these attachments are removed very easily by simply touching them with an instrument or aqua dissection without any bleeding. Only 10% developed pain after surgery and had a third look laparoscopy in which adhesions were seen to be the cause of pain, the scores were reduced when compared to the initial surgery, especially in grade and severity. In other cases there were other reasons fo pain like adnexal tumor, appendicitis and others. Thus the success rate of the gasless adhesiolysis with SprayGel™ and SprayShield™ in patients being adhesion and pain free is about 85%. WHAT IS SECOND LOOK AND THIRD LOOK LAPAROSCOPY FOR ADHESIONS? The principle of SLL was first introduced by Swolin to evaluate the result of some surgical procedures. 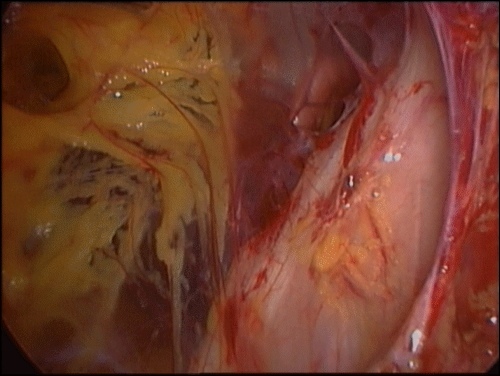 This principle soon became a routine used by many gynecological surgeons and investigators allowing a chance to perform adhesiolysis for the de novo or recurrent adhesions encountered during SLL. Repeat surgery for adhesions in these cases is usually less extensive and does not usually involve the same amount of dissection that led to the formation of adhesions in the first place. 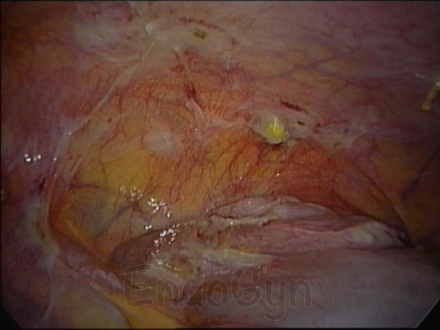 The same was shown by Jansen, who reported that second-look laparoscopy resulted in a significant reduction in adhesions at the time of a “third-look laparoscopy”. Trimbos-Kemper reported a reduction in the incidence of ectopic pregnancy in women who had undergone SLL, although the intrauterine pregnancy rate was unchanged. Surrey and colleagues reported a 52.1% intrauterine pregnancy in 31 patients who had undergone early SLL after reconstructive pelvic surgery. 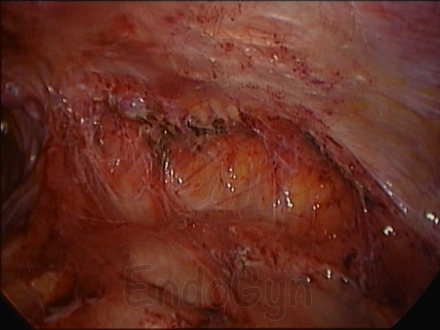 Other potential advantages of a second-look laparoscopy include the ability of the surgeon to assess the efficacy of surgical techniques or adjuvants like adhesion barriers in adhesiolysis procedures, as well as to provide the patient a reasonable assessment of likely prognosis. If the patient is among the approximately ten percent of subjects in whom adhesions worsen, that patient may benefit from early referral to ART as opposed to protracted lengths of time spent trying to conceive against very long odds. Dr Kruschinski offers a third look laparoscopy to patients who are still symptomatic after 3 months of second look laparoscopy. While surgeons see an improvement / reduction of adhesions score as a success, patients often see the reduction or improvement or a complete disappearance of symptoms as a success! 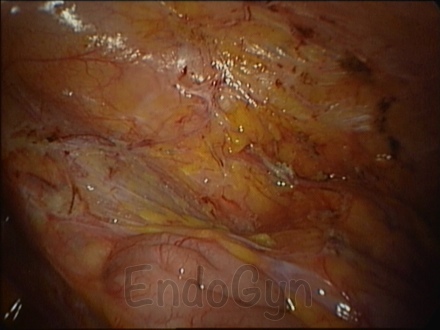 Even after a second look laparoscopy some small adhesions may return. In our patients collective there is a huge success rate with reduction of adhesions, but still some small adhesions might have formed somewhere and cause pain. Hence , a third look laparoscopy will help identify and treat these small adhesions which cause symptoms. Trimbos-Kemper and co-workers went to further “third-look laparoscopy” in patients who had undergone an early second-look procedure with adhesiolysis at that time. They reported that more than half of the adhesions that were separated at the second-look laparoscopic procedure did not recur.